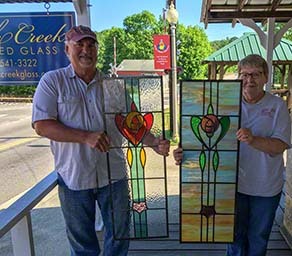 In this class, students study the basics of the "Tiffany-style" stained glass art which include the proper method to cut class, project design considerations, construction of a copper foil panel including soldering and framing a finished panel. Students will complete a copper foil project. (Note: There will be some studio time required outside of class to complete the project). Class meets one day a week for two hours for a total of seven weeks. Tuition: $400, which includes use of all tools required to make the class project; purchase of supplies are required before class starts and you'll need to bring a few minor sundry items you most likely already have at your house. In this class, students build on the basics of glass cutting and grinding they learned in the Introduction to Copper Foil class and incorporate those skills into lead came"church-style" stained glass art. We cover project design considerations, construction issues involving a lead came panel including soldering and framing and complete a finished panel. (Note: There will be some studio time required outside of class to complete the project). Class meets one day a week for two hours for a total of four weeks. Tuition: $400, which includes use of all tools required to make the class project; purchase of supplies are required before class starts and you'll need to bring a few minor sundry items you most likely already have at your house. In this class, students will go back to basics on soldering a copper foil panel; we cover work area organization, surface preparation, flux usage, when to use what solder, proper base preparation, different ways to do 60/40 build-up and fixing problem areas. Students bring in the panel they're currently working on. Prerequisite: Really Lousy 60/40 Soldering Skills!! !